Milan Fashion Week kicked off the other day, straight after LFW, hot styles walked down the cat walk and I'm here to share my favorite looks/ designers so far. Alberta used many different textures and patterns in his pieces, which I loved. For instance the dress featured below is just simply beautiful. 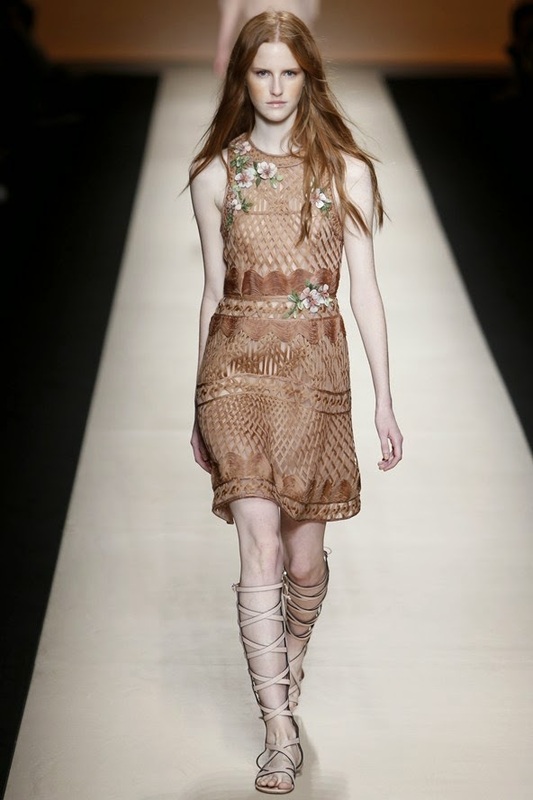 I love the little embroided flowers against the brown crochet dress with knee-high gladiators. I also adore the 2nd dress as its flowly, and god-ess like with a trailing floral pattern down the body. Blumarine used bright, fun colours to represent the summer vibe, which totally worked! I LOVE the dress below, it's so wearable, I would wear this to a summer party or out for lunch its so versatile too, dress it up and dress it down! Same goes for the second dress, I love the colour white and light blue, and again this is the perfect summer piece with the cute floral design! It appears floral's are in for spring/ summer 2015? Once again another floral dress made it's way along the catwalk, however instead of cute delicate patterns Giamba has created bright, graphic florals, like the dress featured below. I like the collection as one minute the clothes are 'wow' and then 'cute' like the second dress here. I love the white little dress with the beautiful peter pan collaring. Of course the spotted tights make both outfits slightly edgy and unique which i love. Giorgio Armani obviously had to be featured on my blog as I love this brand and they didn't disappoint me either! 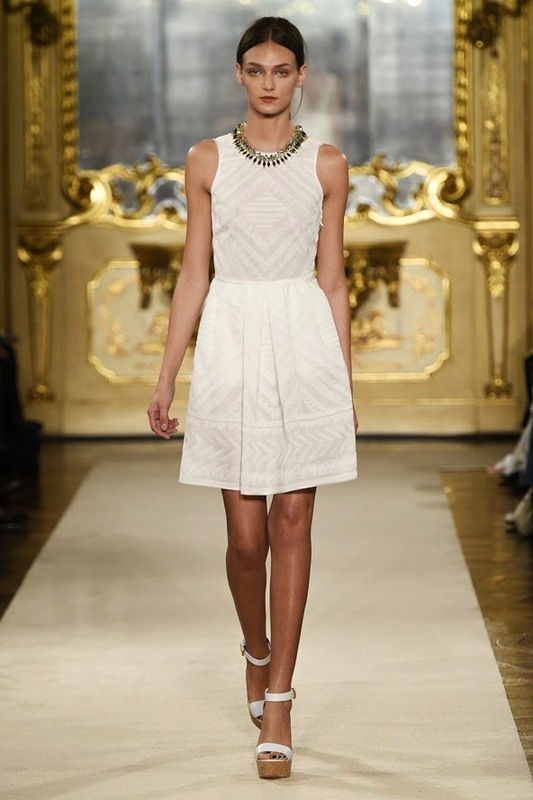 The collection was classy and elegant wearing mainly neutrals. I love the jacket below as the texture looks really interesting and the colour can be suited for any occasion. I also love the trousers in the second outfit, the quirky wave print makes the outfit stand out, I can imagine this piece walking down the streets of Paris! I have to say I am stunned by the outfit below as this is right up my street. I love the shirt, the combination of a spotted fabric against simple block colours like yellow, totally works! The navy high waisted shorts complete the look as it singes in at the waist with a navy clasp belt. Perfect for dinner out or shopping with your friends! The collection was beautiful, whites and statements necklaces made hearts in my eyes (cringey but true). The dress below is fab, a sheer leaf pattern over a simple white tunic, paired with cork shoes and a gorgeous, red statement necklace really make the outfit classy. Same with the second dress, I love the different patterns and textures represented throughout the collection. Mainly featuring blacks and whites the collections was a win-win with unique patterns and textures. The dress below is stunning with cute, little, floral detailing alongside a v- neck, perfect for a romantic get away. The second dress is slight daring, with sheer panels running through it and a fur clutch create a punk/ rock vibe which is totally a favorite of mine at the minute.